The photomicrograph above shows a monocyte (left) and two neutrophils(right) and highlights the differences between the two. The monocyte is mononuclear cell 12-20µm in diameter (about 1.5-2.5 times an erythrocyte). The nucleus is kidney shaped or U shaped and has a fine chromatin. The cytoplasm is blue-grey cytoplasm with fine azurophilic granules and may show vacuolation. 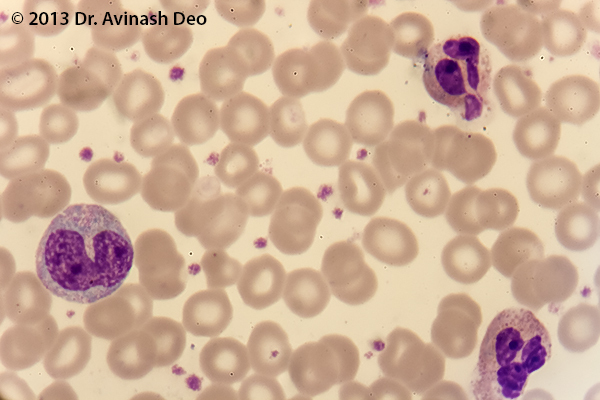 These features are seen in the monocyte in the photomicrograph above. Neutrophil, a contrasting cell, is smaller (12-15µm or 1.5-2 times the erythrocyte), has a nucleus with 3-5 lobes with a clumped chromatin. The cytoplasm has pink granules.